Sophie Huber, 2018, U.S., 85 min. Blue Note Records explores the vision behind the iconic American jazz label. Since 1939, Blue Note artists have been encouraged to push creative boundaries in search of uncompromising expressions. Through current recording sessions, rare archival footage, and conversations with iconic Blue Note artists, the film reveals an intimate perspective of a legacy that continues to be vital in today’s political climate. 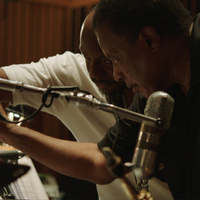 Legendary artists Herbie Hancock and Wayne Shorter come together with today’s generation of groundbreaking Blue Note artists such as Robert Glasper and Ambrose Akinmusire to record an all-stars album. These reflections lead us back to the highly influential figures of the past on which the legacy of Blue Note is built: Thelonious Monk, Bud Powell, John Coltrane, Art Blakey, Horace Silver, and Miles Davis. The film strongly communicates the values that jazz embodies and that Blue Note has been promoting since its inception: freedom of expression, equality, and dialogue — values that are as relevant today as they were when the label was founded. With a post-film jazz performance by the Adam Maness Trio.